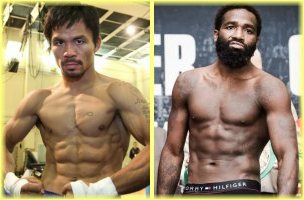 Adrien Broner is called “The Problem” but it’s likely WBA welterweight champion Manny Pacquiao will be “The Solution” when they face off, tentatively in Las Vegas on Jan. 19. The fight is a must-win for Pacquiao as it’s a prelude to a much-awaited rematch with undefeated Floyd Mayweather, Jr. In 2015, Mayweather pounded out a unanimous 12-round decision over Pacquiao but it came with the Filipino battling one-armed after dislocating his right shoulder in the fourth round. Despite the handicap, Pacquiao never backed off and even won in some sportswriters’ scorecards at ringside. A return engagement will test whether Mayweather can preserve his unblemished record against an injury-free Pacquiao. But first things first. Broner, 29, is in the way of the rematch and Pacquiao, 39, must dispose of the hurdle to seal the second appointment with Mayweather. Broner is no slouch with a 33-3-1 record, including 24 KOs. He’s a former WBO superfeatherweight, WBC lightweight, WBA superlightweight and WBC welterweight champion who was once ranked among the world’s top five pound-for-pound fighters. The 5-6 Cincinnati native recently inked a five-fight $50 Million contract with Al Haymon of Premier Boxing Champions. Although Broner has captured four titles in different divisions, he wasn’t particularly impressive in his last three fights. He scored a split 10-round decision over Adrian Granados in Cincinnati in February last year, lost a unanimous 12-round verdict to Mikey Garcia in Brooklyn five months later and last April, fought Jessie Vargas to a majority 12-round draw in Brooklyn. “Adrien’s been more flat-footed, sitting in the pocket, he’s a way more talented fighter than that,” said Broner’s trainer Kevin Cunningham, a former narcotics detective who has worked with ex-world champions Cory Spinks, Devon Alexander and David Diaz. “If you put yourself in a position to cut and chop, it’s better but until then, you’ve got to set it up. He has a lot more tools in the box but he hasn’t been using all the tools.” With Cunningham and father-figure Mike Stafford in his corner, Broner is expected to go all out in the biggest fight of his career. Matt Christie of the weekly London trade magazine Boxing News called Broner “the master of the unexpected.” Christie wrote, “the gifted boxer-puncher is fast and his right hand, launched through, round and under defenses, remains an impressive weapon.” Lack of discipline and professionalism has been a problem for Broner and twice, he failed to make weight in world title bouts. Broner’s personal life has been a “Problem,” too. In 2007, Broner was charged with robbery and felonious assault. The next year, he was involved in an illegal possession of a weapon case, a witness intimidation case and a domestic violence case. In 2010, Broner was again accused of robbery and two years later, was charged with assault. In 2016, he was charged for beating up a man outside a bowling alley and stealing back $14,000 he lost in gambling. However, all of those charges were dismissed and the only sentence Broner ever received was a 30-day prison stay for showing up in court three hours late and drunk. Against Vargas whom Pacquiao beat on points, Broner did his usual posturing, shaking of the head, posing and goading. In the ninth round, Broner got serious and unleashed a vicious combination capped by a right uppercut that buckled Vargas’ knees. When the draw was announced, Broner insisted he deserved the decision. In his career, Broner has been decked by only Argentina’s Marcos Maidana.